A recent Science-paper (.pdf) used a total sample size of N=40 to arrive at the conclusion that implicit racial and gender stereotypes can be reduced while napping. 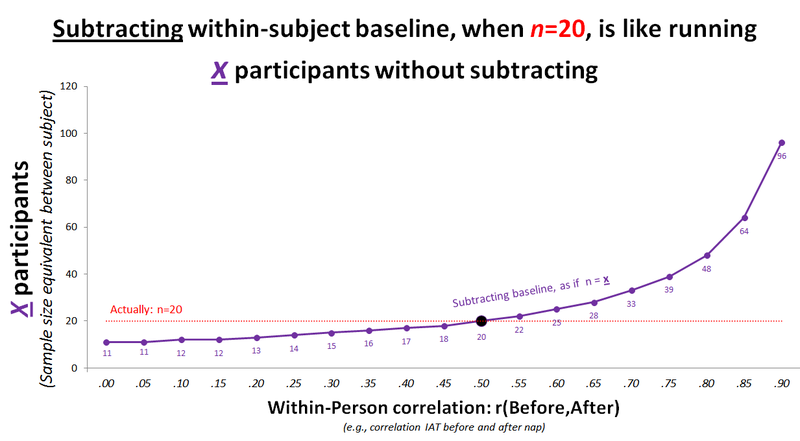 Reasonable question: How much more power does subtracting baseline IAT give a study? Surprising answer: it lowers power. Participants took the gender and race IATs, then trained for the gender IAT (while listening to one sound) and the race IAT (different sound). Then everyone naps. While napping one of the two sounds is played (to cue memory of the corresponding training, facilitating learning while sleeping). Then both IATs are taken again. Nappers were reported to be less biased in the cued IAT after the nap. This is perhaps a good place to indicate that there are many studies with similar designs and sample sizes. The blogpost is about strengthening intuitions for within-subject designs, not criticizing the authors of the study. Let’s simplify the experiment. No napping. No gender IAT. Everyone takes only the race IAT. Between-subject test: is the mean IAT different across conditions? Mixed design test: is the mean change in IAT different across conditions? Subtracting baseline, going from between-subject to a mixed-design, has two effects: one good, one bad. Good: Reduce between-subject differences. Some people have stronger racial associations than others. Subtracting baselines reduces those differences, increasing power. Bad: Increase noise. The baseline is, after all, just an estimate. Subtracting baseline adds noise, reducing power. Imagine the baseline was measured incorrectly. The computer recorded, instead of the IAT, the participant’s body temperature. IAT scores minus body temperature is a noisier dependent variable than just IAT scores, so we’d have less power. If baseline is not quite as bad as body temperature, the consequence is not quite as bad, but same idea. Subtracting baseline adds the baseline’s noise. See the simple math (.html). Or, just see the simple chart. Aside: one can avoid the power-drop entirely if one controls for baseline in a regression/ANCOVA instead of subtracting it. Moreover, controlling for baseline never lowers power. See bonus chart (.pdf). 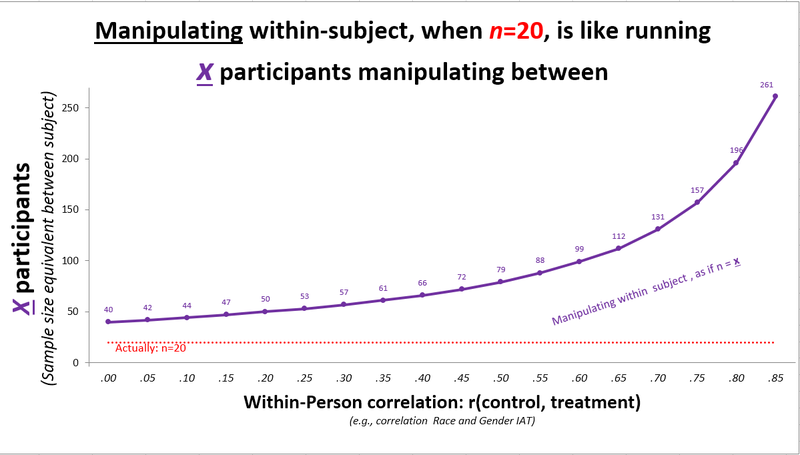 In addition to subtracting baseline, one may carry out the manipulation within-subject, every participant gets treatment and control. Indeed, in the napping study everyone had a cued and a non-cued IAT. How much this helps depends again on the correlation of the within-subject measures: Does race IAT correlate with gender IAT? The higher the correlation, the bigger the power boost. note: Aurélien Allard, a PhD student in Moral Psychology at Paris 8 University, caught an error in the R Code used to generate this figure. He contacted me on 2016/11/02 and I updated the figure 2 days later. You can see the archived version of the post, with the incorrect figure, here. 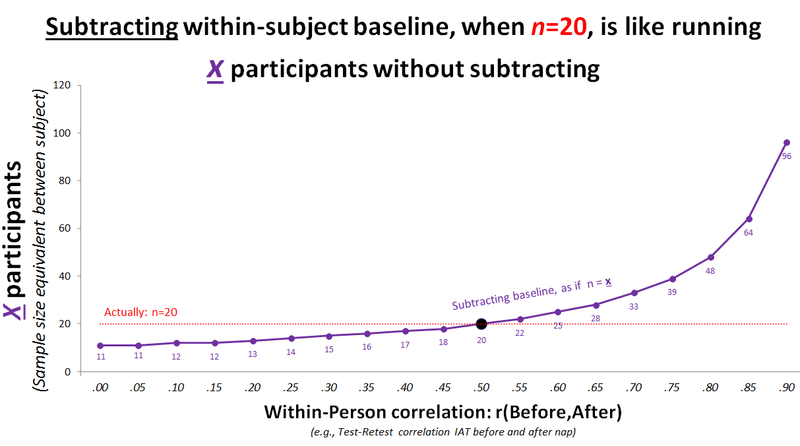 When both measures are uncorrelated it is as if the study had twice as many subjects. This makes sense. r=0 is as if the data came from different people, asking two questions from n=20 is like asking one from n=40. As r increases we have more power because we expect the two measure to be more and more similar, so any given difference is more and more statistically significant (R Code for chart) . Race & gender IATs capture distinct mental associations, measured with a test of low reliability, so we may not expect a high correlation. At baseline, r(race,gender)=-.07, p=.66. The within-subject manipulation, then, “only” doubled the sample size. So, how big was the sample? I shared an early draft of this post with the authors of the Science-paper. We had an extensive email exchange that led to clarifying some ambiguities in the writing. They also suggested I mention their results are robust to controlling instead of subtracting baseline.